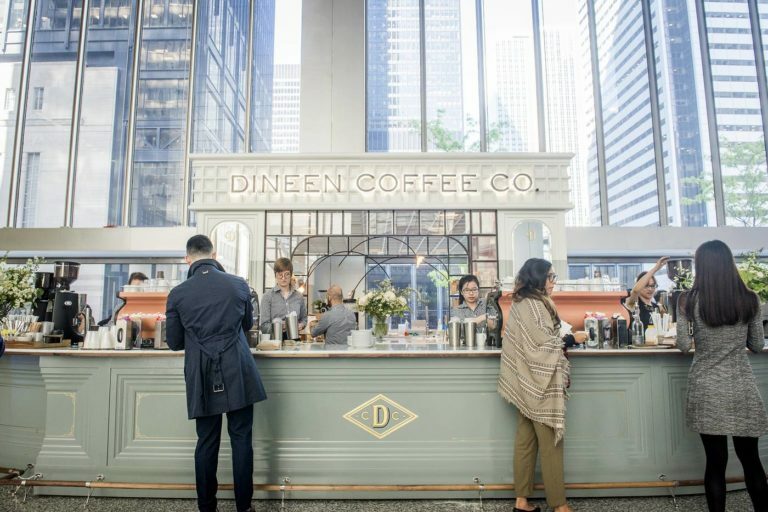 Commerce Court & Dineen Coffee Co. The Commerce Court West building in Toronto is one of the most important and prominent structures in the downtown core, with a premiere location at the corner of King and Bay Street. It is the centerpiece of Commerce Court, a four-building complex. Yet, with a minimalist architectural design (by famous I. M. Pei who designed the Louvre) the 5,000 square feet of open lobby space has often felt cavernous. This presented an opportunity to create a new amenity and enhance the environment. Objectives for the project included bringing a sense of community to the lobby and the entire complex, providing a potential new source of income and creating a beautiful space for tenants and visitors to gather. The venture would only be successful by partnering with the right retail company. Understanding the importance of finding the right tenant for this unique space, the QuadReal team took an unprecedented approach. Instead of opening a tender process, the QuadReal team was decidedly selective, approaching only the few operators that they felt would be a good fit. Dineen was the obvious choice based on the quality of their offerings, their design fit with the existing architecture, their financial performance, and master planning considerations to determine the operator’s degree of flexibility and construction time. Former operators of the Landing Group, Dineen is defined by the exceptional quality and taste of its offerings. They are champions of beautiful, unique designs, incorporating a European bistro feel that is uncommon amongst their peers. Most importantly, they have a solid track record of success, as trust was critical in determining who would bring such an important space to life. Dineen and QuadReal tossed out the landlord/tenant playbook and instead collaborated together to create an experience for their clients and our customers. We couldn’t be happier with how it turned out. This collaboration that involved many departments at QuadReal was true to the spirit of Commerce Court’s respected tradition in the market place: Rich in Tradition, Focused on the Future. Today, the lobby is filled with a new, vibrant energy as those who call Commerce Court home now have a place to gather. A multitude of seats around the Dineen counter and throughout the lobby are always occupied, and the sound of conversation, business and laughter fills the once quiet lobby. A community has been created, one where tenants and the public intertwine to create something that feels special, as well as being functional. It has attracted significant attention, too. The positive feedback from tenants, members of the real estate community and the public through blogs has been overwhelmingly positive. The goal to create something special in Commerce Court West’s lobby took nonconformal, creative thinking and a great degree of tenacity as Dineen and QuadReal worked together to design a custom solution that would benefit everyone. It required treading unpaved paths, but it was well worth it in the end. Everyone is reminded at how central a gathering place Commerce Court offers at the corner of King and Bay. Creating a custom solution with Dineen has been so rewarding, for so many. Most importantly, on the sometimes-bumpy journey to animate this unique space, a strong relationship between Dineen and QuadReal was born. The willingness to be flexible, creative and innovative – on both sides – has resulted in a strong partnership that is sure to last.